Status: Common regular breeder western Panhandle, hybrids and introgressants with Eastern Towhee elsewhere except extreme southeast. Uncommon spring and fall migrant statewide. Rare regular winter visitor southeast, rare casual elsewhere. Hybrid zone between Spotted and Eastern towhee shown in the area with cross-hatching with pure Spotted Towhees occurring in the panhandle west of the dashed line. Documentation: Specimen: UNSM ZM7252, 24 May 1900 Monroe Canyon, Sioux Co.
Taxonomy: There are 19 subspecies currently recognized (AOU 1957, Pyle 1997, Gill and Donsker 2017), 10 in Mexico and Central America. The other nine occur north of Mexico and are often divided into two groups, Coastal, including four subspecies limited in distribution to the Pacific Coast from British Columbia southward, and Interior, including five subspecies: falcinellus, resident in southern Oregon to central California, curtatus, breeding in interior southwest Canada and interior northwest USA and wintering to southern California and southern Arizona, montanus, breeding in southwest USA and northern Mexico and wintering to southwest Texas, arcticus, breeding from central Alberta, central Saskatchewan, and central North Dakota, south, east of the Rocky Mountains, to southeastern Wyoming, northeast Colorado, and central northern Nebraska, and wintering to southwest New Mexico and south Texas, and gaigei, resident in southeast New Mexico and west Texas. Nebraska breeding birds are arcticus (AOU 1957). There is a single specimen record of montanus taken 5 Oct 1915 at North Platte, Lincoln Co; the remains were “badly decomposed” but parts were submitted to H. C. Oberholser, who confirmed that the bird was indeed montanus (Swenk 1918, Tout 1947). Subspecies montanus has been recorded in Morton Co, Kansas (Johnston 1965, AOU 1957), and may occur more often in western Nebraska as a fall migrant than the single record suggests. Subspecies montanus is at least partly migratory, although its breeding range is mostly west and south of Nebraska (Bartos Smith and Greenlaw 2015). Hybridization between Spotted and Eastern (P. eryphrophthalmus) Towhees on the Great Plains is well-known (Sibley and West 1959, Short 1961, Bartos Smith and Greenlaw 2015). Sibley and West (1959) provided the basis for elevation of these two taxa to species status (Banks et al 1995), primarily due to occurrence of pure phenotypes in the hybrid zone, indicative of assortative mating. Current thinking (e.g., Figure 2 in Bartos Smith and Greenlaw 2015) is that essentially all towhees in Nebraska are intergrades, with pure Spotted Towhees only in the western Panhandle and pure Eastern Towhees occurring only in the Missouri River Valley from the Platte River mouth to the Kansas border. 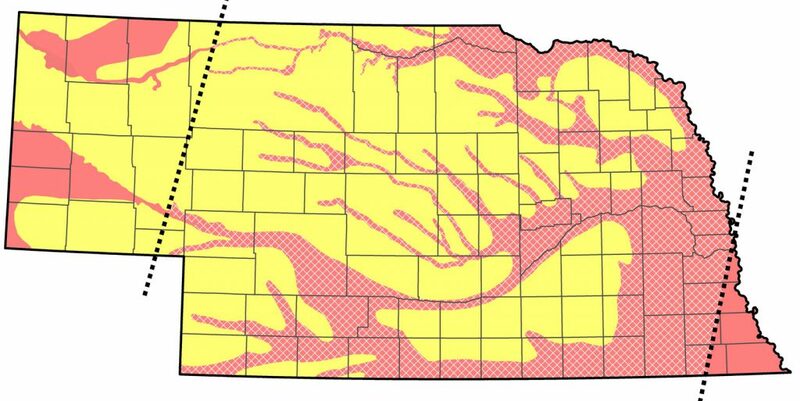 Bartos Smith and Greenlaw (Figure 2; 2015) showed that within the hybrid zone (most of the state), Spotted Towhee genes predominate in the Panhandle, the northwestern Loup drainage, and along the northern edge of the state following the Niobrara River Valley and Missouri River Valley east to the Yankton area, while Eastern Towhee genes predominate elsewhere. Oddly, Bartos Smith and Greenlaw (Figure 2; 2015) show an area in the southeast corner where no towhees purportedly occur. We question this point; there are multiple reports of Eastern Towhee in this southeast corner of the state (Otoe to Gage Cos and southeastward). An intergrade specimen was collected near Lisco, Garden Co 12 Jun 2018 and deposited in the Cornell University Museum of Vertebrates. Despite the above range outline, birds resembling phenotypic Spotted and Eastern Towhees may appear in the hybrid zone where the other species generally predominates, and mixed or unusual songs are common over most of the state. Sibley and West (1959) found no difference in “hybrid index” between birds at Blair, Washington Co and in Lincoln Co. Scharf (2005), during a four-season netting study in the “nesting season” (no dates were given for captures, nor was any breeding evidence presented), found 20 Eastern Towhees of phenotype category 0 (“pure” Easterns, per Sibley and West 1959) along the Platte River in Dawson Co 2001-2004. Two phenotypic male Spotted Towhees singing Spotted songs were carefully studied at Rose Creek WMA, Jefferson Co 27 Jul 2016, and another was near Steele City, Jefferson Co the same day. There had been no “verified records” of birds resembling phenotypically pure Eastern Towhees for the Keith Co area until 2000 (Brown and Brown 2001); since then, one was at Lake McConaughy 21 Apr 2007, one was in Dawson Co 25 May 2010, and one was found in southeast Lincoln Co 5 Jun 2004, where, however, the “vast majority” are Spotted Towhees. During 2013-2014 there were several reports from Scotts Bluff Co, essentially within core Spotted Towhee range, of birds resembling phenotypically pure Eastern Towhees, including males singing Eastern songs. Six were found at two locations 4-21 May 2013, one of which was still present 21 Jul. One at Gering Cemetery 4 May 2013 was “unspotted, singing an Eastern song”, and on 21 May a single male, an unspotted female with a Spotted male, and a hybrid were found. In spring 2014, Eastern-like birds with minimal back spotting, but singing Eastern songs, along with at least one phenotypically pure Eastern male were near Mitchell, Scotts Bluff Co 12 May; one with a “black back except for the white wing spot” was in the same yard 6 May, and a singing male was at Gering Cemetery 9 May. It is interesting that these birds are reported at the same time Spotted Towhees re-appeared on their Panhandle breeding range, usually about a month later than Eastern Towhees arrive in the southeast. It is tempting to consider these later migration dates as evidence that these birds are hybrids despite resembling pure Eastern Towhee phenotypes. Similarly, in the core southeastern Nebraska range of Eastern Towhee, a male at Schramm SP, Sarpy Co 21-29 May 2005 that looked and sang like a Spotted Towhee did possess about half of the white primary patch typical of Eastern Towhee. The role of epigenetics in expression of phenotypes was reviewed by Fresard et al (2013); whether this mechanism is operative among Pipilo towhees in the Nebraska hybrid zone is as yet conjectural. In central and western Nebraska, where wintering is rare, arrival is in late Mar and early Apr, with central birds arriving significantly earlier. There is an earlier Panhandle report 13 Mar 1957. Wintering birds in the south and east depart by mid-May. High counts: 85 at Lake Ogallala, Keith Co 30 Apr 2000, 45 at Lilley’s Sandpit, Hall Co, 9 May 1998, and 42 in Hall Co 11 May 2002. Summer: BBS data 1966-2015 (Sauer et al 2017) show fairly even distribution within the virtually statewide range, with perhaps higher numbers in southwestern and northwestern Nebraska. BBS trend analysis shows Spotted Towhees have increased 3.86% (95% C.I. ; 0.77, 6.88) per year in Nebraska 1966-2015 (Sauer et al 2017). An earlier arrival in the east was one in Lancaster Co 12 Sep 2014. Most departing birds leave the summer range by late Oct, although lingering birds make determination of departure dates difficult. The last seen in Valentine in 2016 was on 9 Oct.
A large total of 120 were banded in the period 24 Aug-7 Oct for the 2015 fall season at Wildcat Hills NC, Scotts Bluff Co, indicating peak fall movement occurs there in Sep.
High counts: 60 near Gibbon, Buffalo Co 10 Oct 1998, 40 in northern Lancaster Co 17 Oct 1998, and 35 at Wildcat Hills NC 24 Aug 2015 (banded). Winter: CBC data indicate that this species is still rather evenly distributed statewide in Dec, although numbers are lowest in the Panhandle and the north. By Jan, reports from the west and north are few; numbers are lowest in Feb, when most are in the southeast. A note regarding Pipilo towhees on the Seward-Branched Oak CBC is of interest, suggesting no overlap of Nebraska winter ranges: “I checked and we have had eastern towhees on the count only three times since 1993. In contrast, we have had spotted towhees 13 times (plus one count week bird). We have never had both species on the same count” (Joseph Gubanyi, pers. comm.). There are 13 winter reports Jan-Mar from the North Platte Valley, and these others from the north and west: 31 Dec 2005 Crawford CBC, 1 Jan 1957 Logan Co, 2 Jan 2010 Lake McConaughy CBC, 3 Jan 2011 Sutherland, Lincoln Co, 12 Jan 2014 Knox Co, 14 Feb 1993 Antelope Co, 23 Feb 1957 Thomas Co, and 3 Mar 1958 Sheridan Co. Photograph (top) of a Spotted Towhee at Fontenelle Forest, Sarpy Co 30 Oct 2008 by Phil Swanson. Banks, R.C., J.W. Fitzpatrick, T.R. Howell, N.K. Johnson, B.L. Monroe Jr., H. Ouellet, J.V. Remsen Jr., and R.W. Storer. 1995. Fortieth supplement to the American Ornithologists’ Union Check-list of North American Birds. Auk 112: 819-830. Scharf, W.C. 2005. New westward breeding records for Eastern Towhees in Central Nebraska. NBR 73: 26-28. Sibley, C.G., and D.A. West. 1959. Hybridization in the Rufous-sided Towhees of the Great Plains. Auk 76: 326-328.